Well, it’s got to that time of year again where the junior Academy programme quiets down for Christmas but the Pro team are back with a vengeance to really hit their training hard!! Christmas time means only one thing in Pro Tennis- Pre-season!!!! I get to work with our pro players for any where between 4 and 6 weeks of uninterrupted training. Most of the guys came back the start of December 2013 and will train with APA up until the end of the second week of January 2014 ready for the British Futures circuit. For those guys who are ranked inside the top 250 in the world they started a bit earlier because they need to be fit for the start of the Australian Open qualifiers. It’s been well documented in British Tennis that Gosling Tennis Academy currently have 3 of the top 6 men in British Tennis training there! So some are staying in the UK and some are travelling to Asia/Australia for the ATP tour events! For this blog I thought I would summarise the overall themes of the Training Blocks that these guys have been following and discuss some of the rational for the design of the training. If you haven’t already read the APA Training Philosophy blog series I did in October 2012 I would definitely recommend you read APA Philosophy 8 on Training Density. This is a pretty good overview of my thoughts on how to set up a training week for pro athletes. It’s worth mentioning that tennis doesn’t really have an extended off-season. After a few weeks off in mid November to recover from the long season (January to November!) they kind of jump straight back into training- which I guess is more like the pre-season of other sports. Normally, you would be looking to develop qualities of speed, strength and power in the off-season over 2-3 months and then look to bring up the conditioning aspect of endurance in the pre-season over another month or so. As Tennis is not afforded the luxury of time you have to get the balance between developing the qualities mentioned above in a space of 4-6 weeks!!! My initial aim is to develop the important qualities of strength and power but also have one eye on the fact that they may be required to endure long matches right around the corner so we can’t neglect conditioning completely. To achieve this I break the 6 weeks into two- the first phase is more focused on strength/power and speed. The second part is focused more on endurance. The first part has what I consider 6 sessions focused on neural overload (those in red or green boxes) and 4 sessions focused on metabolic overload (those in purple). The rest are either tennis sessions, recovery S&C sessions or off court classroom sessions. Figure 1. Pre-season week 2 of 5. I’ve chosen week 2 to show you as week 1 was slightly different due to it including testing sessions on Monday and Tuesday. Week 2 is a pretty good guide to the set up for the week’s training where I am focusing on strength, power and movement. So basic structure is half-day Wednesday and full day-off Sunday. The idea is that high neural demand activities that require the athlete to be reasonably fresh (strength/power and movement sessions) are done earlier in the week and/or following a rest day. The highest volume of conditioning work is saved for the end of the week. This way I can start the week with neural overload and finish it with metabolic overload. Therefore, Monday and Thursday are big strength/movement days (lots of neural fatigue- planned specifically to be done the day after a rest). Friday and Saturday are focused on conditioning. 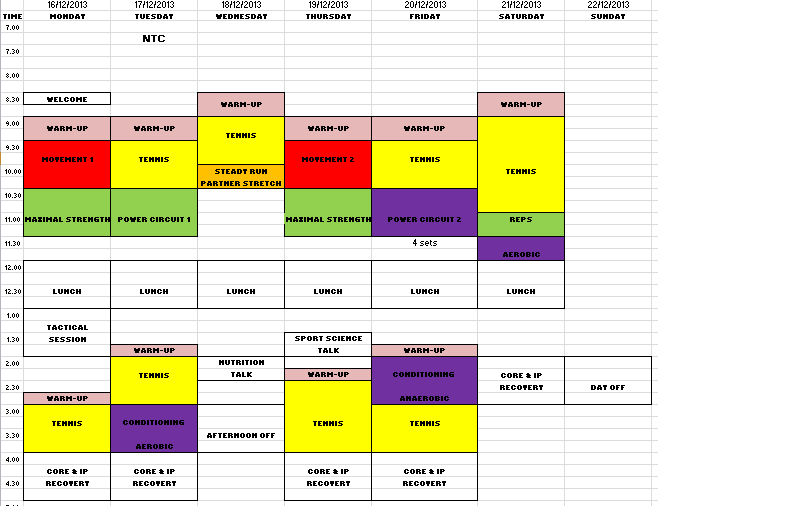 Note: all sessions in purple boxes are metabolic focused. The power circuit on Friday is a metabolic session because it involves repeated efforts of jumps, throws and sprints with incomplete recovery. The aerobic session is an submaximal interval session usually on a bike, and the anaerobic session is repeated sprints on a tennis court, again with incomplete recovery. I did think about leaving out the conditioning session on Tuesday afternoon. There are a lot of coaches that will say don’t mix your neural and metabolic sessions in the same day, especially if the last session of the day is metabolically demanding. The rational being that you will dilute the training effect and the body will remember the last training stress of the day and adapt to that most. But I put the aerobic session in because I wanted to make sure that the athletes were getting a sufficient volume of training in on the full days (3 sessions a day of S&C including the recovery session) and I felt there was still a strong enough emphasis on neural work over the course of the two days to warrant them doing one conditioning session (aerobic intervals) as the last big session of the day on Tuesday. In my previous blog on Training Density I talked about how in-season I normally go for 2-3 weights sessions per week due to the competing demands of the athlete’s sport. Well in the off-season/ pre-season I’m open to going up to 4 or 5 sessions because this is the only time I can create enough fatigue to overload the body without worrying about them being able to perform in their sport. I guess the template I have gone for is similar to the one Olympic weight lifters use where there is two days of push (maximal strength- Monday and Thursday). But I haven’t gone for two pull days (power -typically done on Wednesday and Saturday). I’ve gone for one power day (Tuesday) and one more hypertrophy only day (Saturday). They are power endurance athletes so I replaced one of the power sessions for a power endurance circuit. I personally subscribe to the view (which is supported by research- see blog for more information) that you only need to do 2 maximal strength sessions per week to develop strength in advanced lifters. I consider this particular group advanced because they can all squat between 1.5 and 2.0 body weight on their 1RM test to good depth (thighs parallel). Therefore in this programme I have elected to do 2 maximal strength sessions (Monday and Thursday) with the first session having a more lower body emphasis and the second having a more upper body emphasis. However they squat in both sessions. The power session is on Tuesday. I will go into more detail on how I do a power session for Tennis players in another blog. For now just appreciate that they combine a moderately heavy explosive lift (such as a high pull) with a body weight jump or medicine ball throw. They are not fatigued while doing these supersets. Now again you could question why it follows the day after a maximal strength session- it should be Wednesday right, like the Olympic wieightlifters? This would surely give them more recovery? Or at least do it on Monday before you do the Maximal strength session?? Well, again it goes back to what I am trying to achieve. I wanted to create neural overload in the first two days (Monday and Tuesday) and make sure I created metabolic overload on Friday and Saturday. I wanted to have rest days on the Wednesday and Sunday to recover from this BUT I was content to do the power session with a little bit of fatigue because I really wanted to make the maximal strength session my priority and do this when they are fresh. I was happy for the power session to be in the presence of a little bit of fatigue, knowing that the weights would be a bit lighter. I also felt the previous day’s heavy lift could potentiate the following day’s explosive lifts. The Saturday hypertrophy session was a weight training session but without any maximal strength (primary/secondary lifts) or explosive power lifts. If you read my blog on Exercise Selection you will see this session is pretty much just muscle conditioning (just assistive and auxillary movements). Because it can be a big ask to expect the athletes to come in on a Saturday for a half day I like them to look forward to this session because it is what I call a vanity session. They do plenty of functional single joint exercises but there’s also room for them to pick a few exercises for their arms and work the guns!!! By including this session this means they are doing 4 sessions in the weights room during this training week which I feel helps to ensure there is a good focus on getting stronger in the early part of the training block. Well that pretty much sums up the overview of a typical training week at the start of the pre-season. In the next instalment I will look at the training week for one of the final weeks of the pre-season where conditioning is the focus. Below is a quick video we made to highlight some of the work the guys have been doing. Hope you like it. Plyometrics – Don't Run Before You Can Walk! Plyometrics training has been used for the past 50 years in athletic training and has been shown to increase jumping performance (Markovic, 2007) especially in dynamic power sports such as tennis, basketball, football and volleyball. For an exercise to be considered plyometric the use of the stretch shortening cycle by the active muscles must exist with a high intensity eccentric contraction followed immediately by a rapid and forceful concentric contraction (Markovic, 2007). Common forms of ‘plyometric’ exercises include various types of jumping, hoping, bounding and bouncing. Popularly jumping over objects and onto boxes features heavily on YouTube videos from around the world. However it is important to consider what makes an exercise plyometric and not just a dynamic movement done at speed. In this article I shall describe the importance of plyometrics, explain what, why and when you should include different levels of plyometric drills and discuss the volume of plyometrics used in an athletes’ programmed load. Why should you include plyometrics in an athletes’ training program? An increased power output is an important characteristic of successful sports players. Plyometrics should only be added to a training program after a good foundation of strength has been established via strength training (Cormie, McGuigan, and Newton, 2011). This has been a common view for several years, however if we examine the physiological effects of plyometric training, whereby significant – up to 10x bodyweight – load is place through the bodies’ muscles, ligaments and tendons, which all combine to create a stretch shortening reflex and a power output, it is possible to find simple everyday exercises than also create similar effects on the body. Everyday examples include running, jumping, hopping, bounding or quick changes of direction. Most of these movements are limited in adult daily life by choice of how we move – we don’t run everywhere or have to jump across gaps in our path like our primal ancestors, however one population group that do several of these movement patterns by choice are children. Children love to play, it increases their learning via sensory feedback and children enjoy running, chasing, jumping, climbing, changing direction etc, especially if this is masked as a game or even sport. However most children will not have a formal ‘strength training’ background. So does that mean we shouldn’t let them do plyometric ‘training’? Ultimately a discussion on this topic will have to wait until a future time where it can be discussed. However my initial take is that ‘plyometric’ activities are a primal form of ‘exercise’ in which we would outrun, jump or throw objects at potential dangers. The fear of injury has led to us questioning this type of training and wanting to find ways of improving our young athletes. Whilst I believe it is important that young athletes complete strength training, they will already be doing plyometrics within their sport, for example; tennis players are taught to split step and be light and agile around the court, this involves many plyometric type movements and muscle contractions. Therefore I see the role of the S&C coach to improve the factors that could lead to injury – landing mechanics, deceleration drills and strengthening of the connective tissues around joints. Teaching young athletes how to perform jumping, quick ground force reactions and balanced landings correctly will also help, however I feel that large doses of plyometrics training is not necessary and should not be prioritised ahead of strength training and fundamentals. Back from this tangent, adult and older or rather more developed adolescents that are involved in a competitive sporting environment should have plyometrics as part of their training. Once a good strength base has been established – values of up to 3.0 x body weight across compound lifts – more advanced plyometrics exercises can and should be used. However as stated at the beginning of this piece, these more advanced exercises are often utilised too early in the stages of development and without having completed the basics first. Overall the aim of the plyometrics is to increase power across a very short space of time – less than half a second. Therefore the speed of the exercise should be of paramount importance ahead of the loading, difficultly or volume. With younger children all the way through to adults simple starter exercises such as skipping (jump rope) and agility based games will encompass several of the outcomes desired. Additional benefits of doing lower level plyometrics can mean an increased volume can be used, a lower risk of injury occurrence and a focus on ground reaction times and stiffness through the ankles can be coached. First step quickness and reactions to external stimuli also increase speed in games play. These skills can be worked on with low level plyometric exercises and will have a significant impact on performance, especially in younger athletes. As stated earlier, many quick feet and low level plyometrics will be used in a games situation, with younger athletes – under 12 – where they may not have chosen a sport they wish to focus on, small sided or 1v1 games such as mirroring, ball drop reactions, tag and agility races will engage the player greater than strict drills focusing on running technique or box jumping. This video shows a few examples of quick feet, low level plyometrics and reaction games that can be encompassed into plyometrics sessions at any level. Once an athlete has been involved in physical training for a period of time which enables them to be stronger, less susceptible to injury and have greater power outputs an increased level of plyometrics can and should be used to develop elite standard athletes. There are many flashy videos available to watch online, however most are impressive feats of jumping onto or over objects, few encompass the eccentric component of the stretch shortening cycle or rebound nature of quick ground reaction times. One must also look at the relativity of certain plyometric exercises to specific sport movements, for example box jumps are not a part of any sport but are a particular favourite of the S&C coach. Rarely do you see lateral plyometrics exercises being showcased on videos; however it is important that athletes can control stretch shortening cycles. Some of the best athletes that utilise plyometrics most effectively can be showcased in this video. Free runners or Parkour athletes have fantastic spring in their movements (stretch-shortening cycle) and are also adept at landing. They train for their sport by doing their sport. This is not always the best approach, but as discussed above many of the training qualities a coach may wish to encompass can be integrated into games and sport specific movements. The key to increasing the difficulty of the plyometric exercise is to start small with the movements and maintain the speed of contraction and quick ground force reaction time. When it comes to the amount of plyometrics you should include in a session there is a lot of differing arguments about how much is too much. Typically I would stick to around 60-100 foot contacts for most sessions. 60 ‘hits’ would be a low volume session, 100 medium and 120+ a high volume session. A ‘hit’ is counted as a single ground force reaction. An example of which is a two-footed jump or bounce and land, however single leg exercises would count as 2 ‘hits’ as the same amount of load is placed on half the ground reaction surface and therefore equates to twice the load as an equivalent. So 10 tuck jumps would equal 10 hits, whereas 10 single leg hops would equal 20 hits. This is important to consider when counting the number of repetitions in a session or over a period of time such as a training week. What is counted as a rep? An important question also. I would only count the reps where a maximal intention to produce force following a stretch-shortening cycle (load-unload) has occurred or an eccentrically controlled landing has occurred. Due to the forces involved in plyometric exercises, especially jumping, I would not recommend anything greater than low level plyometric exercises for beginners. The joints and structures particularly in the legs – knees, ankles – and in female exercisers (larger Q angle and common valgus knee alignment issues) are in a vulnerable state if not physically strengthened prior to engaging in this type of activity. In conclusion, plyometric exercises are great for increasing power output from an athlete. An appropriate strength training program should precede dynamic explosive exercises but low level plyometrics can be encompassed concurrently alongside strength training. Care should be taken with the level of athlete, their past training history, age, gender and injury history being taken into consideration. http://athleticperformanceacademy.co.uk/wp-content/uploads/2015/05/APA-Logo1-300x156.jpg 0 0 apa.social2 http://athleticperformanceacademy.co.uk/wp-content/uploads/2015/05/APA-Logo1-300x156.jpg apa.social22013-12-17 19:48:172013-12-17 19:48:17Plyometrics - Don't Run Before You Can Walk! The stresses and strains of training hard are important to creating overload and adaptation in becoming a fitter, stronger and faster athlete. The approach to achieving gains is different in every sport and every person; however common themes and methods of training have been researched and shown to have significant effects. For example, heavy resistance training will increase an athletes’ strength, speed/sprint training will make an athlete faster, pushing yourself harder for longer will build stamina and engaging in activities such as yoga will increase suppleness. All of these aspects should be considered when designing training programs. However one area is often overshadowed when it comes to program design, recovery. Recovery can be defined as “regaining what was lost” or simply returning an athlete to a pre-training state of readiness (Stone, Stone, Sands, 2007).This is arguably one of the most important areas, as it is during the recovery from overloaded training that the athlete actually begins to change physiologically into a different beast. When putting together your athletes program, planned recovery is vital. How you want the athlete to be able to perform everyday can also be linked to the training goal – if gaining maximal strength is the goal, lots of recovery from high intensity but short duration exercise is needed, whereas if improving stamina in a games player such as tennis, where they are required to compete daily at high intensities for up to two weeks, recovery will not be 100% complete after everyday due to the volume of work they must endure, but should be factored into the overall program to allow varying intensities of training. In this article, I’ll examine the current research on different types of recovery strategy, give a few examples of what has worked in the past and put forward a plan that can be used to help you. Static: holding a stretch at a set length for 20-30 seconds, this can be done actively by the athlete or passively with assistance from either a partner or equipment. Dynamic: movement based flexibility, where the muscles are progressively taken through an increased range of motion under a controlled tempo. The use of external equipment such as stretching beds, bands, Swiss balls can also assist in enhancing this form of stretching. PNF: Proprioceptive-Neuromuscular-Facilitation is where the muscle is taken to a length of stretch and then the athlete pushes against the resistance of a partner or piece of equipment for ~6 seconds to initiate the activation of the Golgi tendon organs and cause autogenic inhibition (relaxation of the muscle after adjustment to the new length) before taking the muscle into a passive static stretch at a greater length. This process is repeated 3-5 times to increase the range of motion and is one of the more effective methods of stretching. SMR: Self Myofascial Release, recent trends in the fitness industry have seen an increase in the usage of equipment such as foam rollers and trigger point release balls as a method of enhancing flexibility by breaking down tough fibrous fascia to increase the elasticity of the muscles and connective tissues. It is based around Myofascial meridians and lines of tension that run throughout the body, arguing that if one area of the body is ‘tight’ it could be due to compensation for a movement or muscle imbalance elsewhere in the body. For further reading on the area, I recommend ‘Anatomy Trains’ by T.W.Myers (2009). Ballistic: not often used for increasing muscle length after training but can be utilised before. Ballistic stretching involves progressively taking a muscle through a greater range of motion in a fast moving dynamic action repeated several times with an increased stretch each time e.g. leg swings. This is not a form of stretching that I would recommend for post-exercise or increasing muscle length beyond a transient phase. Something to consider about stretching that is often overlooked is to utilise the full range and angles available to stretch at a given joint. Often just the main muscle fibres are focussed on and stretching of peripheral fibres, lateral, medial, superior or inferior to belly of the main muscle can require changed angles, amounts of tension and length of stretch. 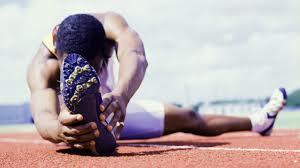 A great follow up read on stretching can be found in ‘Stretch to Win’ by A. And C. Frederick (2006). Immersion in water has been used as a relaxation and recovery method for thousands of years. How many times have you heard someone say they had a nice hot bath and now feel relaxed? Regardless of the temperature, water causes hydrostatic pressure to act on the bodies’ fluids in the immersed regions. The removal of swelling or oedema and post exercise metabolites such as lactic acid from peripheral areas will assist in the recovery process. In more recent times cold water has been used in recovery processes’ also. Cold water causes shunting of the peripheral blood towards the thoracic region. Superficial blood is also redirected into deeper tissue to maintain body temperature, as the process of homeostasis and auto-regulation takes full swing. From personal experience of having ice baths or cold water baths, you certainly feel the thermogenic effects of the transfer of blood. I have always found cold water baths helpful in my recovery process, although I mainly only used them when I return from training with a significantly elevated body temperature or I have trained in hot conditions. The cooling effect lasts for up to 2 hours, by which time I will have had the chance to eat, stretch and rest and return to a pre-exhausted state. Hot water immersion causes vasodilation and increased circulation. Blood moves superficially in order to maintain core temperature and also increases the supply of oxygen to clear post exercise metabolites in the skeletal musculature. Hot or warm water immersion is typically the common practice of most exercising individuals, if not simple for the fact that we prefer warm water to cold, however the increased circulation in the peripheral muscles after exercise may not be the best solution to recovering from intense training. Overheating of the muscles can cause post-exercise metabolites to pool or remain in the muscles and can lead to cramps or an increased amount of time to return to pre-exercise state. The use of alternate hot and cold water immersion can therefore be of benefit via the alternation of these physiological states, this is known as a flushing effect or contrast bathing. The use of contrast bathing has been associated with decreases in muscle damage markers (creatine kinase) and perceived muscle soreness post-exercise as well as the removal of blood lactate and other metabolites post-exercise. However this does not guarantee complete recovery post-exercise and repeated performance within a few hours can be sub-optimal. This brings us back to the question of what you are recovering from and how long you have in order to return to a pre-fatigued state. Cold water immersion is generally between 8-15°C. Hot water immersion is generally between 38-42°C. The ratio of hot: cold immersion is commonly controlled at 2:1, with no significant changes in perceived soreness following 1 minute immersions, but positive outcomes when using 2 minute plus immersions. Recommendations would be to do 2-3 minute cycles between hot and cold immersion. The overall time frame for immersion has been experimented with; 15 minute protocols have elicited greater physiological responses than shorter protocols of 3-5 minutes. Based on this recommendations would be to complete 12-20 minutes on contrast bathing dependent upon immersion times and number of cycles. Importantly though if water temperatures are not controlled the effects of contrast bathing are significantly reduced, if at all present. Possibly the most important area to have corrected in order to speed up recovery. Just like running a Formula 1 car on high octane fuel, athletes too need to replace the correct amounts and types of fuel in their bodies in order to repeat high intensity performances. I could write a whole other blog about nutrition for athletic performance and no doubt will in the future, however the key principles needed when talking about nutrition for recovery are proteins and carbohydrates. Proteins repair the damage done to muscle cells by free radicals released during high intensity training and carbohydrates replace the muscle and liver glycogen stores (energy tanks) within the body in order to continue functioning at high intensities. 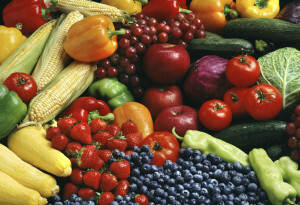 Carbohydrates also help with the co-ingestion of protein and increase absorption levels when combined. Optimal ratios depend upon the type of exercise / sport and the duration and intensity. Endurance athletes such as marathon runners, tri-athletes and swimmers should use a recovery ratio of 4:1 CHO:PRO, whilst intermittent sports players could use a ratio closer to 2:1. Refuelling of nutrients should occur within 2 hours post-exercise, ideally around 30 minutes after completion, to enable blood to begin flowing around the digestive organs again after exercise induced shunting. The quantities that you should consume are also important during this ‘open window’ of time after training. Dependent upon your sport and the type of training you have just completed – strength and endurance training needs would differ significantly – however not much more than 40g of protein can be digested in any single serving, protein above this value is likely to not be processed and simply be excreted. Often supplement companies will sell their product based around you receiving a massive dose of protein – often far greater than can be digested – in order to gain size, mass, strength or perform longer. I my opinion this is marketing in order for you to buy more of their product. Typically 20-40g per serving or meal is sufficient for protein. If the ratios mentioned previously are to be followed this would leave approximately 80-160g of CHO for endurance athletes and 40-80g of CHO for sports players. Recovery drinks are useful for gaining these needed macronutrients quickly and in an easily digestible form. Hydration is also vital to recovery. As little as 2% dehydration can result in decreased performance and often several litres or kilograms of fluids can be sweated out during exercise. Recommendations are to consume 1.5x the amount of fluids lost during exercise. You can calculate how much fluid you have lost by weighing yourself pre and post-exercise. If possible you should also aim to replace the electrolytes lost from sweating, notably sodium, potassium and magnesium, these can be obtained through eating fruits, vegetables and nuts or via an electrolyte supplement such as ‘EleteWater’. Massage is the ‘ultimate’ recovery method. It combines the movement or superficial blood back towards the organs for clearance of post-exercise metabolites and deoxygenated blood. It can lengthen the fascia, connective tissue, myofibrils and muscle fibres to an improved state of readiness. It can be used to release muscle tension and knots and it is also relaxing and therapeutic if performed correctly. However it is possible to have a bad massage and this can have a negative effect of recovery. The type, duration and area massaged has to be correct in order for the athlete to enhance recovery. This is why working in a multi-disciplinary team and utilising expert advice where possible creates a best practice scenario. Massage is also expensive and time consuming as it requires another person to perform, so may not be the ideal scenario. The use of some of the above techniques can be just as productive towards enhanced recovery and importantly can be conducted individually and easily. For example when away in another country alone, a player can utilise bands, balls and rollers along with good nutrition and contrast bathing to facilitate an equal effect. Recovery for repeated performances is vital to success at the highest levels. There are many inexpensive and convenient methods available to the exercising athlete and most simply require, forethought and planning. Ultimately looking after your body as an athlete is your primary job, finding your own individual recovery strategy that works for you can help you win more and achieve greater success. Thank you for reading, be sure to check out the website and twitter feed for updates on current training and further articles. ‘Anatomy Trains’, Myofascial Meridians for Manual and Movement Therapists. Thomas Myers, (2009). ‘Stretch to Win’ A. And C. Frederick (2006). Becoming a Supple Leopard: The Ultimate Guide to Resolving Pain, Preventing Injury, and Optimizing Athletic Performance. Kelly Starrett (2013). Cochrane, D. (2004). Alternating hot and cold water immersion for athlete recovery: A review. Physical Therapy in Sport, 5: 26-32. Gill, N., Beaven, C. and Cook, C. (2006). Effectiveness of post match recovery strategies in rugby players. British Journal of Sports Medicine 40: 260-263. Haddad, H., Laursen, P., Chollet, D., Lemaitre, F., Ahmeidi, S. and Bucheit, M. (2010). Effect of cold or thermoneutral water immersion on post exercise heart rate recovery and heart rate variability indices. Autonomic Neuroscience, 156 (1): 111-116. Hamlin, M. (2007). The effect of contrast temperature water therapy on repeated sprint performance. Journal of Science and Medicine in Sport, 10: 398-402. Lateef, F. (2010). Post exercise ice water immersion: is it a form of active recovery? Journal of Emergencies, trauma and shock, 3(3): 303. Pugh, L., Edholm, R. and Fox, R. (1960). A physiological study of channel swimming. Clinical Science, 19: 257-273. Vaile, J., Halson, S., Gill, N. and Dawson, B. (2008). Effect of hydrotherapy on the signs and symptoms of delayed onset muscle soreness. European Journal of Applied Physiology, 102 (4): 447-455. Wilcock, M., Cronin, J. and Hing, W. (2006). Physiological response to water immersion: a method for sport recovery? Sports Medicine, 36: 747-765. Zuluaga, M., Briggs, C., Carlisle, J., McDonald, V., McMeeken, J., Nickson, W., Oddy, P. and Wilson, D. (1995). Sports Physiotherapy: Applied Science and Practice. Churchill-Livingstone, Melbourne.